Subsidies, a Thing of the Past? It was 5:00 o'clock in Ankara in February of this year, I was making my way to Esenboga Airport. Driving trough Dikmen and Asagi Ayranci, relatively well­ to do segments of Ankara, I witnessed something which became the subject matter of this article; the bread lines. 'Apparently, all over Turkey now, such scenes are a part of daily life and this disheartening scene on my part has been a major topic of discussion in the media for an extensive period of time. There doesn't pass a day in Turkey that a news item related to, bread lines is not printed; some sad, some curious; from articles on the newly emerging, more affordable, "stale bread" ("bayat ekmek") market, to articles stating: "con­sumption of bread, despite con­sumer subsidies fell from a daily 12M to 8M in Istanbul" respec­tively. Further self induced study and self provoked thought brought out two results: One, 1 was sad to see Turkey swallowed so far deep into this black hole called subsidies, currently with no hope of a propelling action to spin itself out of this endless cycle and two, to see that this monster of subsides being a global disease especially in underdeveloped and the so called developing countries. Along the lines, there is good news and bad news on the matter of subsidies and the breadlines in Turkey. Good news #1: TURKEY IS NOT ALONE: Turkey is not the only country where such re employed, Turkey is not the first country where lines of sorts are a part of daily scene. As a matter of fact, the reason the lines of people in the US for instance are invisible is because the supporting bureaucratic system and the related work force are ‘’ efficient’’ enough to do the job through means other than actual lines of people on the streets. Established in 1862 by President Abraham Lincoln for instance such a work, force. in this country, the Department of Agriculture (USDA) has become one of the largest agencies in the Federal government with more than 120,000 employees. For every four full time farmers in the US there is one USDA bureaucrat on the payroll. Good news #2 THERE MAYBE , GOOD SUBSIDIES: An analyses of subsidy policies for industrial and developing countries in four sectors: energy, road transport, water and agriculture may show that not all subsidies are "bad" and indeed, that there may be "good" subsidies. In fact, what makes the subsidy issue so complicated is that the difference between benefi­cial and harmful subsidies may well lie in the details. A BRIEF WORKSHOP ON THE CONCEPT OF SUBSIDIES before going into “bad”. A definition of a subsidy is that it is a payment of money or another form of an aid that the government gives to a person, organization or businesses. It’s purpose is to encourage some needed activity by furnishing funds, free land, tax relief, or legal rights that might otherwise be lacking. And the subsidies come into two shapes and forms: Consumer subsidies and production subsidies. When governments grant production subsidies, what is mind is to provide a leveled playing ground for domestic businesses who may need to compete with foreign competitors, or to encourage private sector contribution to national economy. In the 1800’s for instance, the United States government gave large tracts of land to the railroads on the condition that they would build lines across the continent. Altogether, the rail­roads received about 160,000.000 acres (64,700.000 hectares) of land in this way. The government also granted subsidies to telegraph and cable companies. In the 1920s, it granted subsidies to ship companies. It gave them generous mail-carrying contracts and allowed them to buy government ­owned ships at a fraction of their actual cost. Government airmail contracts have also aided the air­lines since the 1920’s. Taxes on goods imported into the United States are also indirect subsidies to US manufacturers who produce the same kind of goods. Governments can also impose a guaranteed minimum price above market level. In this case, government policy also subsidizes production. A consumer subsidy on the other hand- which results in such things as bread lines , is directly lowering market price of commodity to help the poor for instance and it can be more sensitive when examining its final effects on an economy such as that of Turkey. 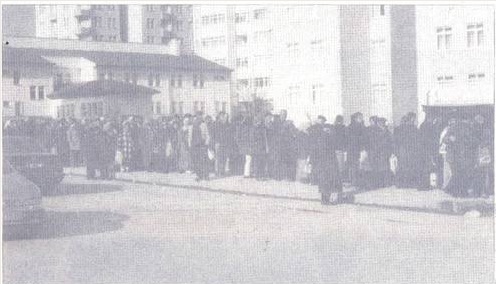 Residents of Ankara in bread line early in the morning. February 2002. In the case of the first type of subsidy - production subsidies-, producers have an incentive to expand supply, sometimes unnecessarily. A production subsidy may encourage producers to accelerate resource deletion and leads to higher production, and it may also potentially create surpluses which can be sometimes most visibly damaging to an economy. In a country such as Turkey when rampant corruption has had its termite-like effect on the whole economy, the idea of some gov­ernment subsidies going to some producers who not only may not increase the production. but may even be producing "imaginary products", can be enough to make the idea of a subsidy raise the hairs on the back of one's neck. Concerning the sec­ond case, a consumer subsidy: economic theory teaches us that in efficient markets private welfare is maximized when prices equal marginal private costs. Any devia­tion from this optimal level will lead to inefficiencies. As this type of subsidy is sometimes improper­ly awarded in Turkey to gain the political support of those receiving the aid, such decisions can end up hurting some other segments of the public economically by creating excessive domestic demand. If the consumption is not constrained, a decrease foreign exchange revenues and a drain on the government budget the economy are experienced. These two types of subsidy policy interventions may even exist simultaneously and create a non-transparent web of various distortions and a huge fiscal drain. Both producer and consumer subsidies, either through overproduction or over consumption, may also cause the environment to degrade or cause other external effects. 1. The economy is simply strong enough to disregard the laws of supply and demand and endure the bleeding: Is the Turkish economy that? 2. The loss of revenues from the subsidized product must be over­come by cross-subsidies ( as in telephone industry, charging resi­dential customers low. rates while making op for the losses by charg­ing the, businesses more): As any­thing else let's say that this is somewhat doable in Turkey, but is it a smart policy to artificially and unfairly shift this additional bur­den from one segment of society to another? If any type of an investment -may it be by the gov­ernment or by the private industries impeded by an unnecessary bur­den such as this on businesses, and this impediment disregards the principles of "trickle down eco­nomics" ( businesses with more resources, invest they contribute to the reduction of unemployment=: employed people with money have more purchasing power = with their purchases they cause the economy to grow even larger), which idea gained popularity and proved to be a successful policy in this country since the Reagan years, why shoot yourself in the foot and kill the bird that can lay golden eggs? The same bird, the private industry in Turkey, whose extraordinary strive single-hand­edly is responsible for any eco­nomical accomplishments of Turkey in the last two decades! 3. Levying additional taxes across the board to recover the loses; How realistic is that for Turkey? Subsidies are often not the right policies: they give the wrong signals and may even be counterproductive. Subsidies tend to waste resources, they do not produce the intended results and they wind up in the pockets of the wrong people. Each year, hundreds of millions of dollars are wasted on subsidies, harming the economy, the environment, equity and trade; these squandered public resources can be used in a much more effective way. Once the consumer subsidies are in place, it is very difficult to wean people from them, especially if political considerations were the underlying initial consideration , and reducing them is certain to cause wide protest just as the ones in Egypt in early 80’s when the bread subsidies were discontinued and the public reaction was so hard that they were reinstated immediately in fear of nationwide major unrest to even destabilize the regime.